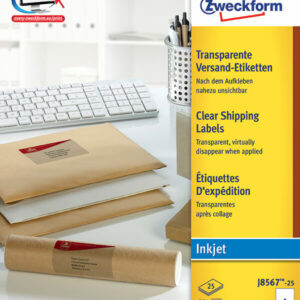 The transparent Shipping Labels J8567-25 for inkjet printers in the 210x297mm format is suitable, for example for addressing parcels and packages. 25 parcel labels on 25 sheets. The transparent Address Labels from polyester film are virtually invisible, ideal for light packaging after bonding, the address thus acts as the package printed. You can rely on an absolutely jam-free printer throughput without glue deposits on the printer. Create and print your shipping label quickly and easily – with the free Avery labels templates and software solutions under www.avery-zweckform.eu/print or the built-in Microsoft® Office package based templates. Easy peel and stick with the unique QuickPEEL ™. 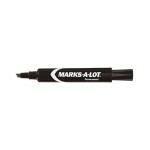 Suitable for all common color / laser printers. 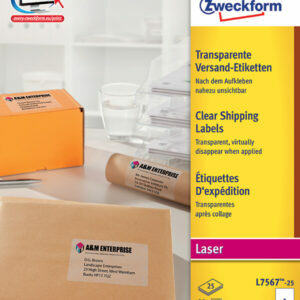 The transparent Shipping Labels L7567-25 for laser printers in the 210x297mm format is suitable, for example for addressing parcels and packages. 25 parcel labels on 25 sheets. The transparent Address Labels from polyester film are virtually invisible, ideal for light packaging after bonding, the address thus acts as the package printed. You can rely on an absolutely jam-free printer throughput without glue deposits on the printer. Create and print your shipping label quickly and easily – with the free Avery labels templates and software solutions under www.avery-zweckform.eu/print or the built-in Microsoft® Office package based templates. 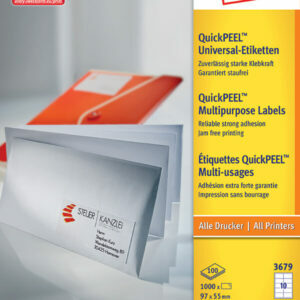 Easy peel and stick with the unique QuickPEEL ™. Suitable for all common color / laser printers. The red, permanent adhesive Labels 3470 in the format 210x297mm Avery are best used for colored product labeling or as information and warning notices. 100 labels on 100 sheets. You can rely on an absolutely jam-free printer throughput without glue deposits on the printer. Design and print your labels quickly and easily – with the free Avery labels templates and software solutions under www.avery-zweckform.eu/print or the built-in Microsoft® Office package based templates. Colored labels suitable for all standard ink / laser and inkjet printers and copiers. 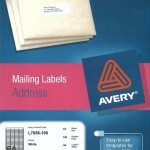 The blue, permanent adhesive Labels 3471 in the format 210x297mm Avery are best used for colored product labeling or as information and warning notices. 100 labels on 100 sheets. You can rely on an absolutely jam-free printer throughput without glue deposits on the printer. Design and print your labels quickly and easily – with the free Avery labels templates and software solutions under www.avery-zweckform.eu/print or the built-in Microsoft® Office package based templates. Colored labels suitable for all standard ink / laser and inkjet printers and copiers. The green, permanent adhesive Labels 3472 in the format 210x297mm Avery are best used for colored product labeling or as information and warning notices. 100 labels on 100 sheets. You can rely on an absolutely jam-free printer throughput without glue deposits on the printer. Design and print your labels quickly and easily – with the free Avery labels templates and software solutions under www.avery-zweckform.eu/print or the built-in Microsoft® Office package based templates. Colored labels suitable for all standard ink / laser and inkjet printers and copiers. The yellow, permanent adhesive Labels 3473 in the format 210x297mm Avery are best used for colored product labeling or as information and warning notices. 100 labels on 100 sheets. You can rely on an absolutely jam-free printer throughput without glue deposits on the printer. Design and print your labels quickly and easily – with the free Avery labels templates and software solutions under www.avery-zweckform.eu/print or the built-in Microsoft® Office package based templates. Colored labels suitable for all standard ink / laser and inkjet printers and copiers. With the crystal clear labels for laser printers L7783-25 of label size 96×50,8mm Avery labels work on shiny surfaces such as printed directly. 250 transparent stickers on 25 sheets of polyester. The transparent, crystal clear Eitketten are ideal for labeling of glass, plastic, metal and shiny surfaces. In addition, they are free of oil, dirt and temperature resistant (-20 ° C to + 80 ° C), water spray and tear-resistant. Design and print your labels quickly and easily – with the free Avery labels templates and software solutions under www.avery-zweckform.eu/print or the built-in Microsoft® Office package based templates. Suitable for all standard laser printers. 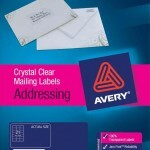 With the crystal clear labels L7784-25 for laser printers in the 210x297mm format Avery labels work on shiny surfaces such as printed directly. 25 transparent stickers on 25 sheets of polyester. 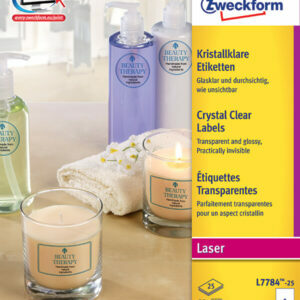 The crystal-clear, transparent Eitketten are ideal for labeling of glass, plastic, metal and shiny surfaces. In addition, they are free of oil, dirt and temperature resistant (-20 ° C to + 80 ° C), water spray and tear-resistant. Design and print your labels quickly and easily – with the free Avery labels templates and software solutions under www.avery-zweckform.eu/print or the built-in Microsoft® Office package based templates. Suitable for all standard laser printers. The white, permanent adhesive multipurpose labels 3425 in the format 105x57mm from AVERY ZWECKFORM are perfect for labelling brochure covers (1000 labels/pack). You can rely on jam-free printing with no adhesive residues left in the printer. Trouble-free printing for laser printers tested and certified by TÜV SÜD. Top adhesion: the labels stick reliably strong on paper, cardboard, glass and plastic. Perfect e.g. for letters, packages, folders, binders and transparencies. Multipurpose labels offer you the perfect label for every need with a pin-sharp image, top anchorage and no smudging. Environmentally-friendly, FSC® certified and chlorine-free bleached. 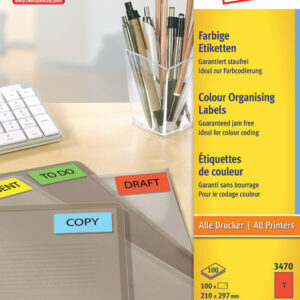 Design and print your labels the quick and easy way – for the free Avery Zweckform templates and software please visit www.avery-zweckform-eu/print or use the templates integrated in the Microsoft® Office packages. Optimum suitability for inkjet-, laser- and colour-laser printers. The white, permanent adhesive multipurpose labels 3426 in the format 105x70mm from AVERY ZWECKFORM are perfect for print approvals, forms, etc (800 labels/pack). You can rely on jam-free printing with no adhesive residues left in the printer. Trouble-free printing for laser printers tested and certified by TÜV SÜD. Top adhesion: the labels stick reliably strong on paper, cardboard, glass and plastic. Perfect e.g. for letters, packages, folders, binders and transparencies. Multipurpose labels offer you the perfect label for every need with a pin-sharp image, top anchorage and no smudging. Environmentally-friendly, FSC® certified and chlorine-free bleached. Design and print your labels the quick and easy way – for the free Avery Zweckform templates and software please visit www.avery-zweckform-eu/print or use the templates integrated in the Microsoft® Office packages. Optimum suitability for inkjet-, laser- and colour-laser printers. The white, permanent adhesive multipurpose labels 3427 in the format 105x74mm from AVERY ZWECKFORM are perfect for print approvals, forms, etc (800 labels/pack). You can rely on jam-free printing with no adhesive residues left in the printer. Trouble-free printing for laser printers tested and certified by TÜV SÜD. Top adhesion: the labels stick reliably strong on paper, cardboard, glass and plastic. Perfect e.g. for letters, packages, folders, binders and transparencies. Multipurpose labels offer you the perfect label for every need with a pin-sharp image, top anchorage and no smudging. Environmentally-friendly, FSC® certified and chlorine-free bleached. Design and print your labels the quick and easy way – for the free Avery Zweckform templates and software please visit www.avery-zweckform-eu/print or use the templates integrated in the Microsoft® Office packages. Optimum suitability for inkjet-, laser- and colour-laser printers. The white, permanent adhesive multipurpose labels 3478 in the format 210x297mm from AVERY ZWECKFORM are perfect for the neat labelling of binders and folders (100 labels/pack). You can rely on jam-free printing with no adhesive residues left in the printer. Trouble-free printing for laser printers tested and certified by TÜV SÜD. Top adhesion: the labels stick reliably strong on paper, cardboard, glass and plastic. Perfect e.g. for letters, packages, folders, binders and transparencies. Multipurpose labels offer you the perfect label for every need with a pin-sharp image, top anchorage and no smudging. Environmentally-friendly, FSC® certified and chlorine-free bleached. Design and print your labels the quick and easy way – for the free Avery Zweckform templates and software please visit www.avery-zweckform-eu/print or use the templates integrated in the Microsoft® Office packages. Optimum suitability for inkjet-, laser- and colour-laser printers. The white, permanent adhesive multipurpose labels 3483 in the format 105x148mm from AVERY ZWECKFORM are perfect for self-adhesive operating instructions, telephone lists etc. (400 labels/pack). You can rely on jam-free printing with no adhesive residues left in the printer. Trouble-free printing for laser printers tested and certified by TÜV SÜD. Top adhesion: the labels stick reliably strong on paper, cardboard, glass and plastic. Perfect e.g. for letters, packages, folders, binders and transparencies. Multipurpose labels offer you the perfect label for every need with a pin-sharp image, top anchorage and no smudging. Environmentally-friendly, FSC® certified and chlorine-free bleached. Design and print your labels the quick and easy way – for the free Avery Zweckform templates and software please visit www.avery-zweckform-eu/print or use the templates integrated in the Microsoft® Office packages. Optimum suitability for inkjet-, laser- and colour-laser printers. The white, permanent adhesive multipurpose labels 3655 in the format 210x148mm from AVERY ZWECKFORM are perfect as content labels, e.g. for moving boxes (200 labels/pack). You can rely on jam-free printing with no adhesive residues left in the printer. Trouble-free printing for laser printers tested and certified by TÜV SÜD. Top adhesion: the labels stick reliably strong on paper, cardboard, glass and plastic. Perfect e.g. for letters, packages, folders, binders and transparencies. Multipurpose labels offer you the perfect label for every need with a pin-sharp image, top anchorage and no smudging. Environmentally-friendly, FSC® certified and chlorine-free bleached. 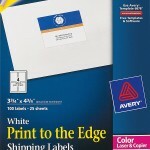 Design and print your labels the quick and easy way – for the free Avery Zweckform templates and software please visit www.avery-zweckform-eu/print or use the templates integrated in the Microsoft® Office packages. Optimum suitability for inkjet-, laser- and colour-laser printers. 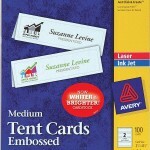 The white, permanent adhesive multipurpose labels 3660 in the format 97×67,7mm from AVERY ZWECKFORM are perfect for labelling documents and folders (800 labels/pack). You can rely on jam-free printing with no adhesive residues left in the printer. Trouble-free printing for laser printers tested and certified by TÜV SÜD. Top adhesion: the labels stick reliably strong on paper, cardboard, glass and plastic. Perfect e.g. for letters, packages, folders, binders and transparencies. The perfect label for every need with a pin-sharp image, top anchorage and no smudging. Environmentally-friendly, FSC® certified and chlorine-free bleached. Design and print your labels the quick and easy way – for the free Avery Zweckform templates and software please visit www.avery-zweckform-eu/print or use the templates integrated in the Microsoft® Office packages. Extra quick handling thanks to the innovative QuickPEEL™ feature. Optimum suitability for inkjet- and colour/laser printers. The white, permanent adhesive multipurpose labels 3679 in the format 97x55mm from AVERY ZWECKFORM are perfect for the labelling of trays and drawers (1000 labels/pack). You can rely on jam-free printing with no adhesive residues left in the printer. Trouble-free printing for laser printers tested and certified by TÜV SÜD. Top adhesion: the labels stick reliably strong on paper, cardboard, glass and plastic. Perfect e.g. for letters, packages, folders, binders and transparencies. The perfect label for every need with a pin-sharp image, top anchorage and no smudging. Environmentally-friendly, FSC® certified and chlorine-free bleached. Design and print your labels the quick and easy way – for the free Avery Zweckform templates and software please visit www.avery-zweckform-eu/print or use the templates integrated in the Microsoft® Office packages. Extra quick handling thanks to the innovative QuickPEEL™ feature. Optimum suitability for inkjet- and colour/laser printers.